Of Maori and European descent, Vanessa is the first person to greet you when you enter Tipene Funerals. Growing up in the West of Auckland where she attended Range view Intermediate, Rutherford College and later completing her schooling at Kaipara College and Church College, however still remains a ‘Westie’ where she serves families in her role at our Onehunga Branch. With a University education from Auckland University of Technology, Vanessa has walked away with a Diploma in Applied Science and currently completing her Bachelor of Health Science majoring in Occupational Therapy. As a devoted member of The Church of Jesus Christ of Latter Day Saints, Vanessa is able to bring her faith in her role when not only working with other LDS members, but also for members of other denominations and religions. 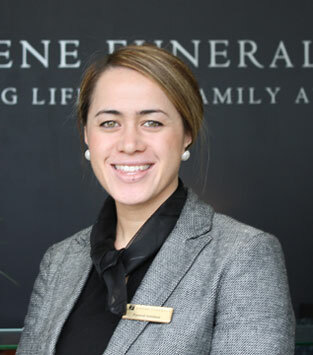 As part of Vanessa’s role at Tipene Funerals, a day in the life of the receptionist includes general administration and secretarial duties, greeting families and ensuring that the Funeral Home is always kept to its high standard of presentation and cleanliness. Vanessa says, “I really love being a part of a team that genuinely wants to serve whanau, and the people I work with which has a real whanau environment to it…”.